The Voice of the Philippines Season 2 was set towards the last Knock Out rounds on January 18, 2015. Team Bamboo, the last camp to get cut down to Top Six, won’t settle for any less. Bamboo said that the fight won’t be easy. The first group had been decided by their coach. Karlo Mojica performed “Usok”. Joniver Robles had chosen “Himig Natin” while Rita Martinez tried her best to get into the top six with “Hit Me with Your Best Shot”. The three had been put together because of their experience and ability to inspire others. Karlo chose the song to express his heart and give more inspiration. Bamboo said that Karlo had been able to show himself. Bamboo said that Joniver was able to be a lot cooler during the rehearsals. Rita said that she could relate with the song because she had been put down a couple of times. Bamboo said that the song’s intensity must be given in the right moment at the right amount. Apl said that Joniver stood out despite having different energy and genre. Lea rooted for Karlo as his energy had flowed into her during her performance. Sarah had chosen Rita. Bamboo said that they were equally divided and the team had to move forward with his decision. Karlo had been chosen by Bamboo followed by Joniver. 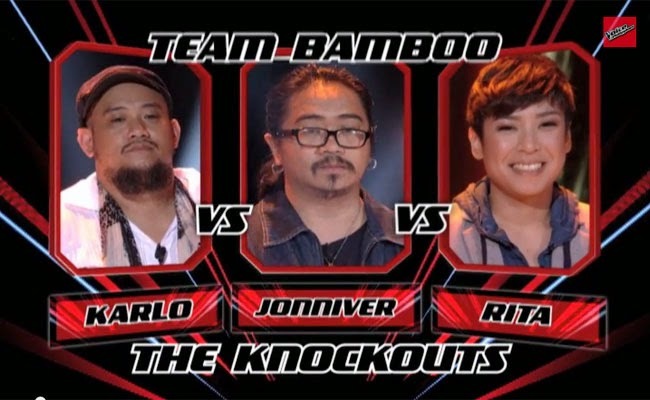 Joniver Robles and Karlo Mojica are the two artist who were the firsts to get into Team Bamboo’s Top Six and go on to the Live Shows.